“Net neutrality” has been built into the fabric of the Internet since its creation — but it is also a principle that we cannot take for granted. We cannot allow Internet service providers (ISPs) to restrict the best access or to pick winners and losers in the online marketplace for services and ideas. That is why today, I am asking the Federal Communications Commission (FCC) to answer the call of almost 4 million public comments, and implement the strongest possible rules to protect net neutrality. When I was a candidate for this office, I made clear my commitment to a free and open Internet, and my commitment remains as strong as ever. Four years ago, the FCC tried to implement rules that would protect net neutrality with little to no impact on the telecommunications companies that make important investments in our economy. After the rules were challenged, the court reviewing the rules agreed with the FCC that net neutrality was essential for preserving an environment that encourages new investment in the network, new online services and content, and everything else that makes up the Internet as we now know it. Unfortunately, the court ultimately struck down the rules — not because it disagreed with the need to protect net neutrality, but because it believed the FCC had taken the wrong legal approach. No blocking. If a consumer requests access to a website or service, and the content is legal, your ISP should not be permitted to block it. That way, every player — not just those commercially affiliated with an ISP — gets a fair shot at your business. No throttling. Nor should ISPs be able to intentionally slow down some content or speed up others — through a process often called “throttling” — based on the type of service or your ISP’s preferences. Increased transparency. The connection between consumers and ISPs — the so-called “last mile” — is not the only place some sites might get special treatment. So, I am also asking the FCC to make full use of the transparency authorities the court recently upheld, and if necessary to apply net neutrality rules to points of interconnection between the ISP and the rest of the Internet. To be current, these rules must also build on the lessons of the past. For almost a century, our law has recognized that companies who connect you to the world have special obligations not to exploit the monopoly they enjoy over access in and out of your home or business. That is why a phone call from a customer of one phone company can reliably reach a customer of a different one, and why you will not be penalized solely for calling someone who is using another provider. It is common sense that the same philosophy should guide any service that is based on the transmission of information — whether a phone call, or a packet of data. So the time has come for the FCC to recognize that broadband service is of the same importance and must carry the same obligations as so many of the other vital services do. To do that, I believe the FCC should reclassify consumer broadband service under Title II of the Telecommunications Act — while at the same time forbearing from rate regulation and other provisions less relevant to broadband services. This is a basic acknowledgment of the services ISPs provide to American homes and businesses, and the straightforward obligations necessary to ensure the network works for everyone — not just one or two companies. Investment in wired and wireless networks has supported jobs and made America the center of a vibrant ecosystem of digital devices, apps, and platforms that fuel growth and expand opportunity. Importantly, network investment remained strong under the previous net neutrality regime, before it was struck down by the court; in fact, the court agreed that protecting net neutrality helps foster more investment and innovation. If the FCC appropriately forbears from the Title II regulations that are not needed to implement the principles above — principles that most ISPs have followed for years — it will help ensure new rules are consistent with incentives for further investment in the infrastructure of the Internet. The Internet has been one of the greatest gifts our economy — and our society — has ever known. The FCC was chartered to promote competition, innovation, and investment in our networks. In service of that mission, there is no higher calling than protecting an open, accessible, and free Internet. I thank the Commissioners for having served this cause with distinction and integrity, and I respectfully ask them to adopt the policies I have outlined here, to preserve this technology’s promise for today, and future generations to come. 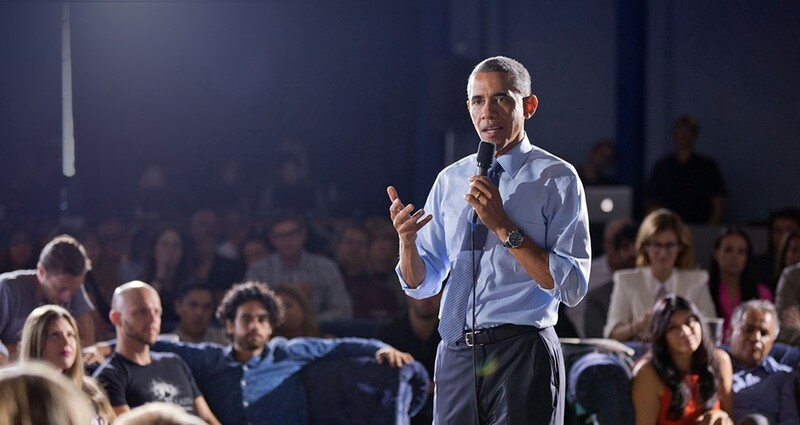 This account will be maintained by the National Archives and Records Administration (NARA) and will serve as an archive of President Obama’s content.